That hooking has lasted to this day, over thirty years of reading and writing haiku – being involved with Haiku Canada as a Western Canada regional co-ordinator, and later, as a facilitator for bringing haiku poets together on “her” island – Gabriola. Gary Synder writes, “Poetry has an interesting function. It helps people “be” where they are.“ Wakan’s chapter Being Here Now begins to distill the essence of haiku. What it is. What it isn’t. Drawing on her contact with Buddhism (“in a superficial way,” she writes) Wakan gives her readers a compassionate view of her relationship with the “imperfect,” the “incomplete.” By giving examples of haiku from some of the best practitioners in English speaking North America: Ruth Yarrow, Alice Frampton, Winona Baker, Michael Dylan Welch, Carole MacRury among others, Wakan is “teaching by example.” Poems are followed by detailed explanations concerning juxtaposition of images, line breaks, pauses, silences. And Wakan spends more time with the classics in her chapter on Wabi-Sabi. While modern Japan is as vulgar as North America, and even traditional Japan had its areas of grossness, two complex terms personify the best in Japanese aesthetics and Japanese poetry for me. ….Wabi is concerned with the simple, the things of quiet refinement, the internal life. Sabi tends to be more concerned with outward esthetic values such as elegant simplicity, the patina of aging, the irregularity of handcrafted things, the unpretentious, and the ambiguous. Both are concerned with imperfection, impermanence, and incompleteness. Writing haiku showed me the way, for it confined me to the parameters of purely speaking of the nouns of images. This discipline allowed me to be more focused and not so scattered. 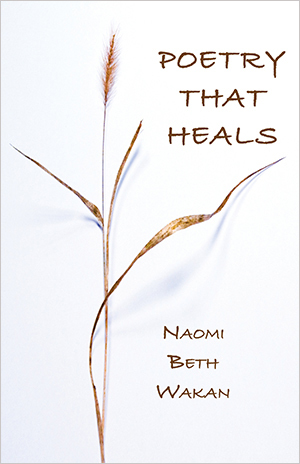 Poetry That Heals is a testimony to Wakan’s own life and to the possibility for others.